Not gunna lie, sometimes I love a good Chipotle bowl. Especially on the go, or when I’m too tired and lazy to cook. Brown rice, black beans, bell peppers, corn, salsa, lettuce, a lil’ guac – what’s not to love? I know they (unfortunately) have a lot of oils but once in a while, I give in… balance right? 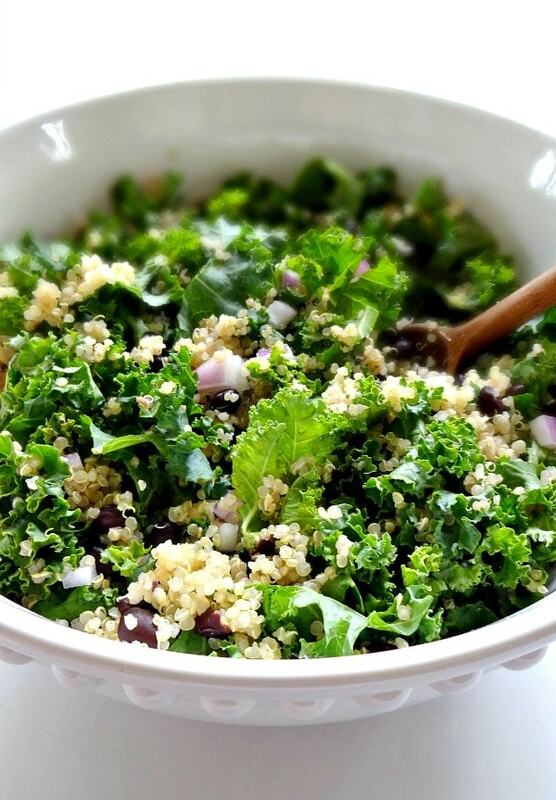 ♥ It was only a matter of time before I shared my recipe for this Spicy Kale and Quinoa Black Bean Salad because it tastes THE SAME as chipotle, and without any oil whatsoever. You don’t need it, I promise. Cooking without oil can take some getting used to but now that I think of oil as pure fat, I do my best to eliminate it completely. This spicy salad is crunchy, savory, bursting with flavor and totally addicting. A crowd-pleaser for sure. It’s the perfect salad for any occasion and can be customized to your “spiciness” liking. 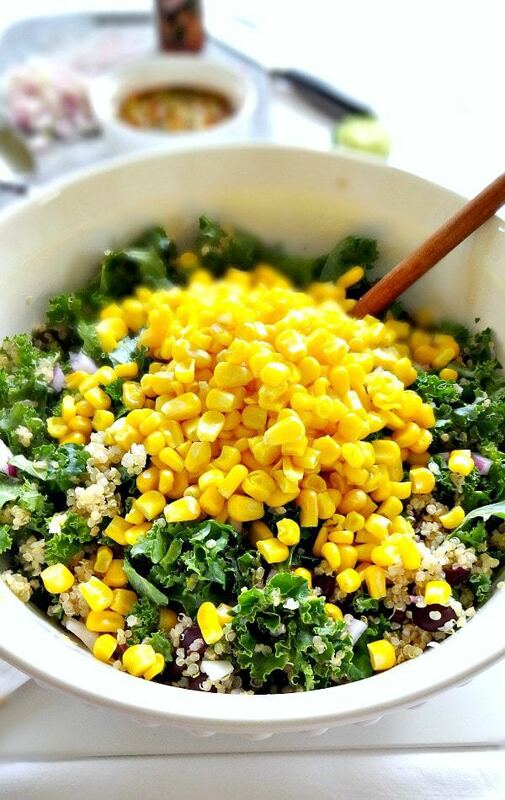 With kale, quinoa , black beans, corn, onion, savory spices, cilantro, hot sauce, lime juice… I mean, you gotta love it. And you gotta try it. 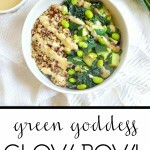 For anyone weary of kale, you won’t notice the 6 cups of green goodness in this giant bowl – the yummy spices and other ingredients overpower the kale while the dressing softens it – what does that mean? THE KALE GETS BETTER, my loves. It can be eaten warm or cold – either way is absolutely delicious. A cold salad for lunch or a warm salad for dinner – your choice! All you do is cook the quinoa, then add the black beans and corn to the pot. Mix it up. 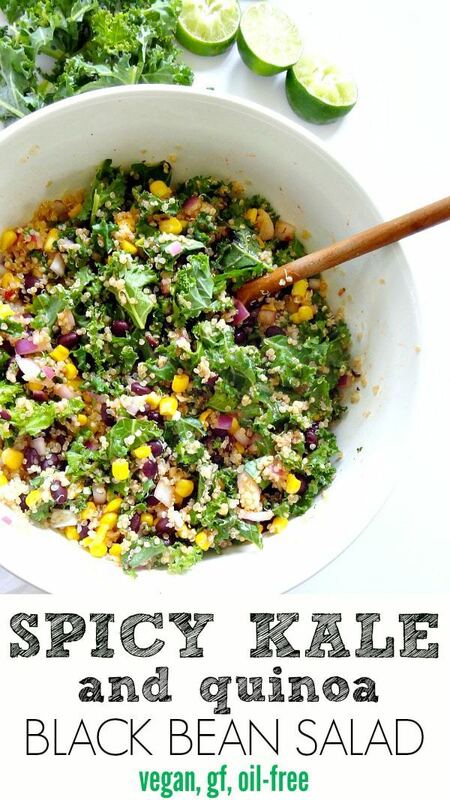 Add heaps of kale and some red onion to a giant salad bowl. Add the quinoa mixture over the kale. 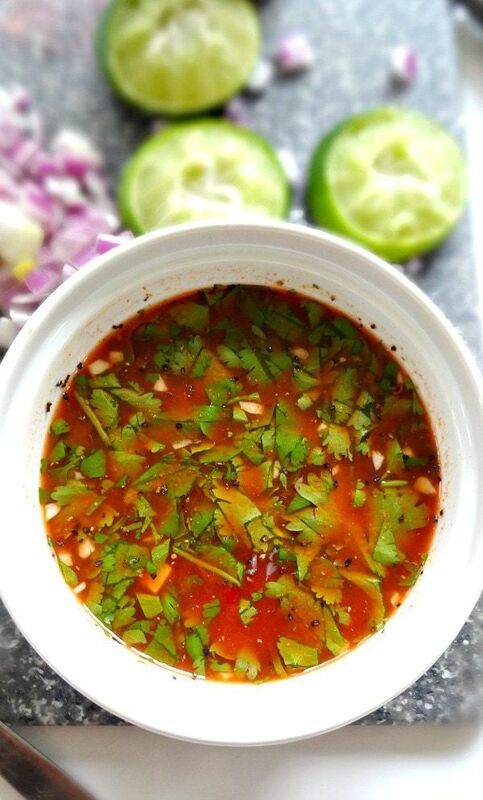 Mix up the spicy dressing. 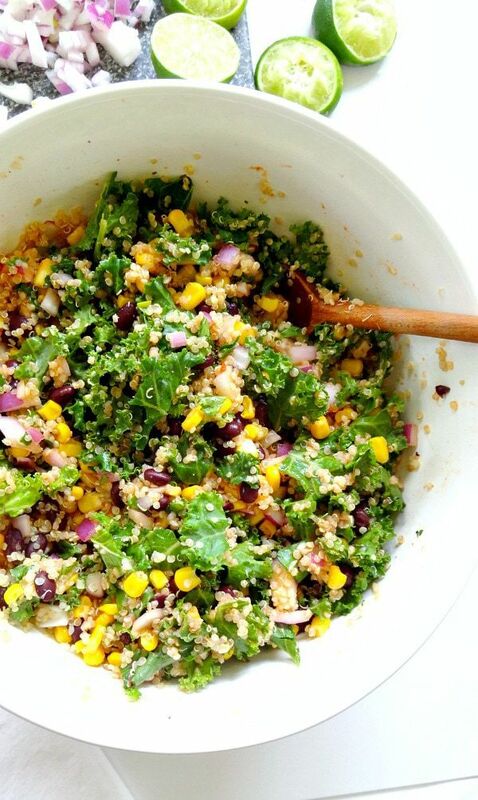 Pour the dressing over the chipotle-like “way healthier” salad. Mix again. That’s it! In under 30 minutes you have a filling, nourishing, absolutely delicious meal for 4-6 people. Or leftovers for yourself. In a large salad bowl, add the kale and the onion. Once the quinoa is done cooking, add in the black beans and corn to the pot. Mix it up. You could just add these over the kale but I wanted to warm up the beans and corn. Add the quinoa mixture over the kale and mix. Stays fresh in the refrigerator up to 2 days. 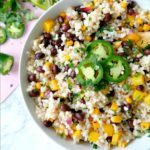 Can replace quinoa with rice and add any additional veggies you like. Bell peppers, tomato, avocado etc. Everything is good except the kale. Is it suppose to be tough and bitter? We are cooking it down in hopes wilting it will make it edible! Wish I could taste yours as it looks so good! Kale is one of the easiest things to grow. When fresh it’s always crisp and tender. I added fresh diced mango and a can of sweet corn to this. I served it over warm quinoa rather than mixing it together. It was divine! There was an earlier comment from someone concerning fats in our diets, A,D,E & K being fat soluble vitamins….they are absolutely right HOWEVER, Dr. Dean Ornish (author of Reversing Heart Disease) and Dr Robert Pritikin (author of The New Pritikin Program) have done extensive studies showing we do NOT need additional fats in our diets. Almost every single food item we put in our mouths have fat, at some level in them. For example, take an apple…fat free right?? WRONG! 0.8g of fat in each apple. 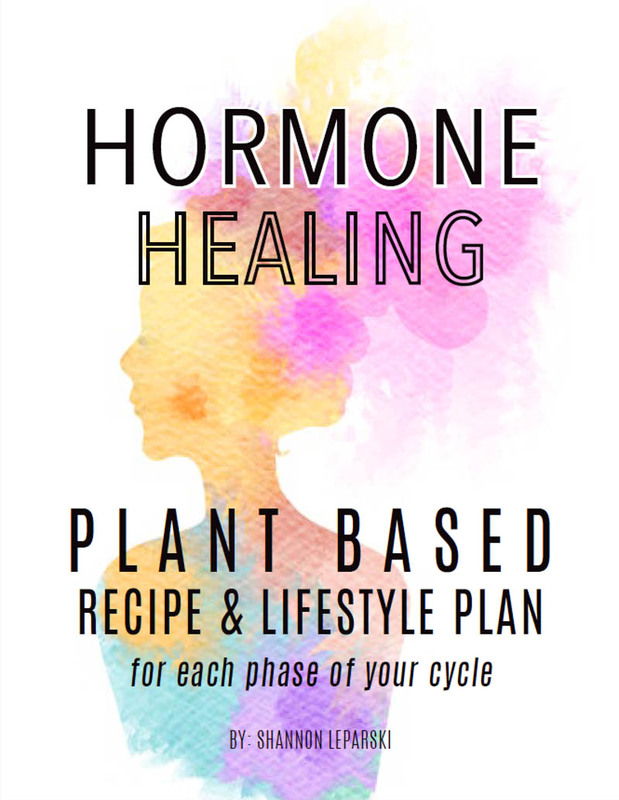 After a day of eating a plant based diet, minimal dairy, we generally consume about 12 – 15g of fat a day, all from plants! Depending on your height and weight (me for example, I am 5’6″ and weigh 197lbs) will determine your fat intake for the day. I am permitted a total of just 22g of fat a day! If I am already consuming 15g a day….I only have 7g to work with!! READ YOUR LABELS. A typical processed veggie burger can have anywhere from 8 – 15g of fat in just ONE burger…lets not even talk about the bun! I have been following the Ornish plan to help my sister (she had a heart attack 4 months and had 2 stints placed). I have never felt better or had so much energy in my entire life (57 years). The Ornish plan was PRESCRIBED by her cardiologist. She attends class for 4 hours twice weekly, they talk nutrition, they exercise and meditate. This no fat way of eating is approved and adopted by many hospitals across the USA….insurance companies completely cover the program. So I totally disagree with your comment about nutritional deficiencies. Look into the Ornish plan and see what you think. I highly recommend you read his books and explore his recipes. I came across the recipe when googling BGood Spicy avacado and lime, kale & quinoa salad. Anyone know if this recipe taste similar to that one? Wow…..One of the best salads I’ve ever had. This salad is full of flavor with just the right amount of kick from the chili sauce. My son whom is a very picky eater really enjoyed it and I’ve had to pull myself away from the bowl. The only change I made was instead of maple syrup I used light Agave nectar. Definitely give this salad a try, you won’t be disappointed. Any way to make it not spicy?? Leave out the hot sauce. This is a brilliant salad! So full of flavor without added oils – perfect for anyone following the Forks Over Knives plan. I was honestly surprised that a dressing made without oil was sooooo good. Thank you! This is an amazing salad! I have just made my second batch in less than 2 weeks 🙂 I made a couple of changes this time. 2. I had some left over red pepper and cucumber in the fridge so I threw it in too. I seeded the cucumber. I am sitting in front of the screen eating a bowl and it is fan-frickin-tastic! I’ve made this a couple of times but forgot to comment until now. 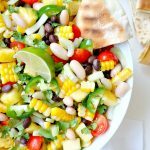 I’m not the biggest salad fan, so I’m always excited when I find good recipes–and this one is so yummy–thanks for sharing it! What type of hot sauce did you use? I used Cholula Chipotle Hot Sauce and it was awesome. 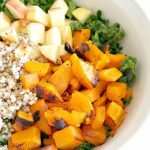 Found this recipe while looking for kale salads. 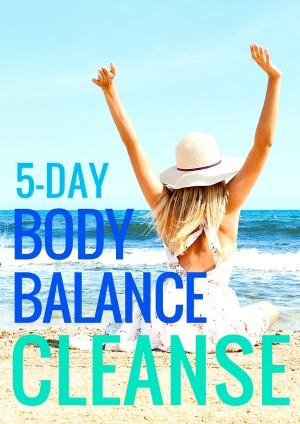 I am concerned by the comment that people don’t need any fat and that you try and eliminate all fat. Please keep in mind that several required vitamins needed to maintain good health (namely A, D, E, and K) are fat soluable vitamins–which means they need fat in order to be processed and utilized by your body. If you eliminate all fat from your diet, then all the wonderful vitamins A and K that you get from kale is wasted. There are many healthy fats–olive oil, avacado, nuts–just to name just a few. If you eliminate all fat from your diet, you are going to run into some severe deficiency problems after a while. I understand your concern. I too love avocados and whole food fats like hemp seeds, sprouted nuts, shredded coconut etc. but extracted oils such as coconut oil or olive oil are completely unnecessary and are not a whole food! I made this today…OMG…it is delicious! I just came across your site looking for kale recipes. Looks like a beautiful website. I hope as I look at more of your stuff you are not anti-fats, but just those which are rancid or improperly processed. in the other nutrients in the salad which require fat to be absorbed. Also another writer asked about freezing this- you can’t freeze greens/lettuces unless you want to eat gross mush once thawed. 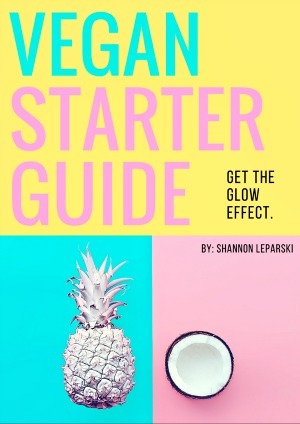 I didn’t know this was a vegan site/recipe so I don’t mean to be offensive! I added feta and grilled chicken, omitted the quinoa (out of pure laziness), and subbed red onion for scallion! This is the perfect work day lunch! I just found your site today! I am a fairly healthy eater, and avid runner & yogi.. but am really looking to tone up for summer time. I haven’t tried any of your recipes quite yet, but this upcoming week is going to be a cleanse of all (most) packaged foods.. & I am excited to have found your site! Thank you!! When you say “hot sauce”, do you mean like a jar salsa like a Tabasco type hot sauce? Yes, like Tabasco. Not salsa. 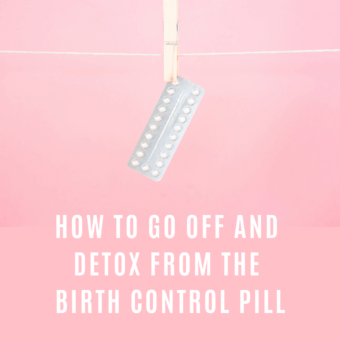 I’ve made this a few times and would love to feature it on my blog (with link and credit of course!). Great salad! I’ve also used the leftovers for a breakfast burrito and added a poached egg. Although I am curious as to what the calorie count is for this salad. Do you have thus information? agree with everyone else…ABSOLUTELY DELICIOUS!!!! Any idea what the calori count would be for this? I’m new to clean eating and still counting my calories. This recipe is truly amazing! I made it for a family gathering this past weekend. It was a huge hit! Even those that don’t like Kale loved it! Oh my gosh Shannon this salad is amazing! I am a brand new vegan as of yesterday so this was only my second plant based dinner. It was just the pick me up that I needed to feel inspired to keep going. Obviously you know how rough it can be when you are just starting out. But if every vegan meal that I have ends up being just half as good as this one, I know I have nothing to worry about lol. Thank you so much for the recipe! This salad is AMAZING! I am not a huge fan of kale but tolerate it because it is so healthy…. but after making this salad… this is a wonderful way to enjoy it. Thank you for a wonderful recipe I will come back to again and agin. Absolutely Delish!! Oh my word! This was SO GOOD! I didn’t have corn or black beans – so I used Chicken (i’m not vegan) Otherwise followed the recipe to a tee – and used Siracha for my hot sauce – and it was RIDICULOUSLY amazing! I could easily eat this EVERY DAY for lunch – and dinner too (like tonight!) Thanks for a great recipe! I have kale growing out of my ears in my garden and have always struggled with bitter taste – well I couldn’t tell at ALL about the bitter taste. 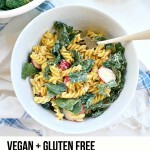 Best Kale recipe EVER! Hey Lindsay! YAY I’m so so happy to hear that 🙂 This recipe is definitely a winner, makes it so much easier to get in extra greens! do you know how this would freeze? Hi Sara, I haven’t tried it but I’m guessing it would freeze just fine. What would you say is the best substitute for the black beans? It seems I’m out of them! Hi Claire! I’d say any other kind of bean would work fine, maybe try kidney beans! This was delicious. My family of teenage boys agreed! 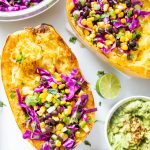 We topped with some avocado and salsa! I saw this recipe this morning and knew I had to make them for dinner tonight. We love homemade burrito bowls as well as those from Chipotle and Moe’s but like you said, the resturant versions are studded with excessive amounts of oil. I’m sure this recipe will be a hit with my husband and three little ones. Keep up the amazing work and take care. Hey Heather – yay! I hope you and your family loved them 🙂 thanks so much!